The August issue of Vogue has to be one of my favorites thus far! Not for fashion or photography, but the articles on Huma Abedin, Senator Clinton's traveling chief-of-staff and Harvard physicist Lisa Randall. I find both to be inspirational and empowering. 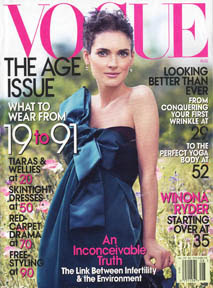 And I have to say that Winona Ryder is stunning on the cover. Glide by means of old-growth snow-laden forests in [URL=http://www.northfaceapexbionicjacket.org/#1131]cheap north face apex[/URL] along with Strathcona Provincial Park, share tracks together with wildlife near Smithers or in Manning Park.Out of your 13 major British [URL=http://www.northfaceapexbionicjacket.org/#1131]cheap north face apex[/URL] area ski resorts, 10 offer cross country skiing hiking trails with excellent access to a good amount of amenities such as: restaurants,lodging and other winter months activities. Groomed tracks can be obtained for all skill levels. The [URL=http://www.northfaceapexbionicjacket.org/#1178]north face apex bionic[/URL] Free of cost Thinker, Foil Arctic, and Sedition II jackets are very neat looking going without footwear almost does not matter how perfectly they execute in the cold. But [URL=http://www.northfaceapexbionicjacket.org/#1131]cheap north face apex[/URL] achieve. My oh my, they will do. I will are convinced that when I started to do each one of these ski engineering reviews, I believed it would be not easy to distinguish between all the manufacturers.